Frank says, "Dégagé has done so much for me that I want to give back by helping other patrons. I believe in their mission and I, too, want to reflect the love of Christ." The Life Enrichment Center is a home base for many of our patrons who depend on the daily, practical services we offer. Many of the services can be easily taken for granted by those of us who have easy access to them. We provide space for the community to receive their mail, take a private shower, do their laundry, receive a haircut, use the bathroom, make phone calls, and rent a locker. We attach a small fee to some of our services, including locker rentals, as a way to instill dignity and respect in those we serve. We have 127 lockers that we are able to rent out to the community for $2 a week. This space is the only safe place that many of our patrons have to store their belongings. Oftentimes, valuable possessions get lost or weathered on the streets. 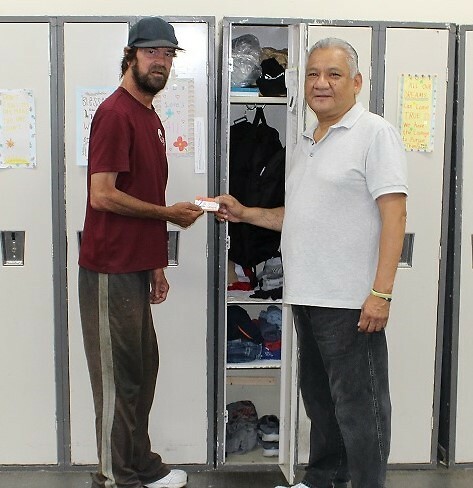 However, through our Job Voucher Program, patrons are able to complete small jobs throughout our building to earn a voucher to pay for services such as a locker space. Frank, above right, not only earns these vouchers but uses them to help other patrons in need. You can see Frank helping his friend Kelly pay his locker rental. Frank says, "Dégagé has done so much for me that I want to give back by helping other patrons. I believe in their mission and I, too, want to reflect the love of Christ."